A company that can assist with insect control in Stretford is definitely needed if you have noticed an increase of bugs in your home. It can be quite unsettling to discover an army of insects have taken up residence in your home. The idea of insects living inside your home with you is unpleasant, and while you can take a few preventative measures to dissuade them from becoming permanent house guests, it is recommended to call on expert help before the problem becomes uncontrollable. 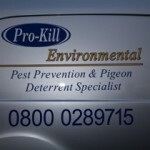 In Stretford, insect control is expertly done by Pro-Kill Environmental. You can give them a call and ask their advice on what to do to get rid of the pesky creatures. Usually, by the time you notice more than a few of the insects, the problem has developed into a large one. Pro-Kill will try to visit you the same day, if at all possible, of your phone call. During their first visit, their technician will perform a thorough inspection of your home to determine the extent of the infestation. A detailed written report regarding the most effective solution to the problem is then compiled. They offer a free, no obligation quote with no hidden extras and the price you are quoted is the price you will pay. Insect control in Stretford is an ideal solution to removing your unwanted crawling house guests. Pro-Kill Environmental provide a high-quality pest control service tailored to your specific needs. They are fully insured to comply with the British Pest Control Association standards, of which they are members, as well as compliant with BioKill Crown. All the staff at Pro Kill are current in their training in Health and Safety. Pro Kill are also certified members of other accredited organiations, providing customers with confidence and assurance about their ability to deal with the insect problem. Having provided effective solutions to pest control problems throughout the North West since 1999, this is the company to contact should you need help with any insect infestation. If you require more information about effective insect control, contact Pro-Kill Environmental. This entry was posted in Pest Control and tagged Insect Control in Stretford, Stretford Insect Control. Bookmark the permalink.